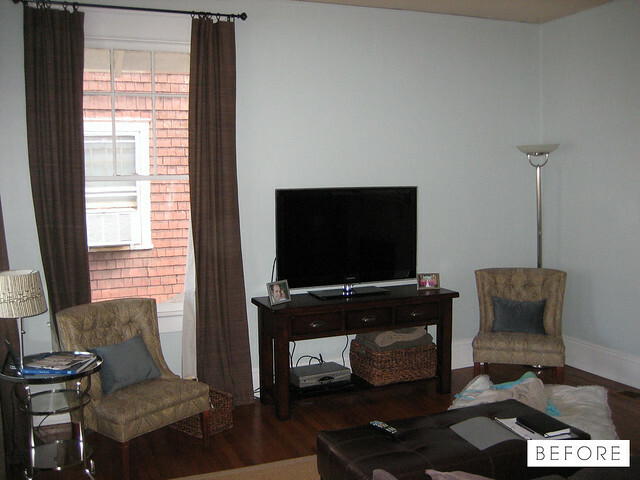 The room had already been painted and furnished when the owners called on me for help. They just needed some assistance finishing it up. 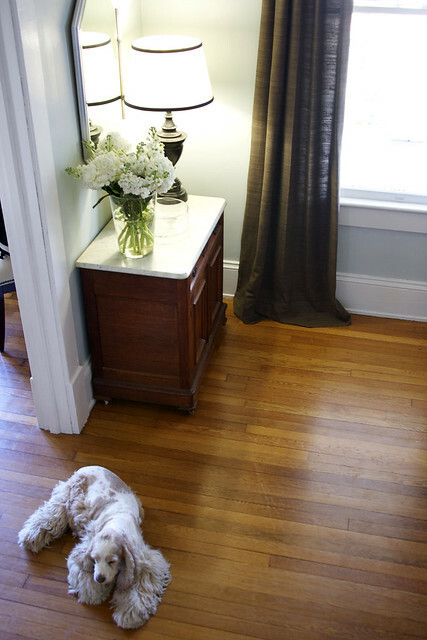 Since the dining room is open to the living room and front door, I wanted the two spaces to work seamlessly together. 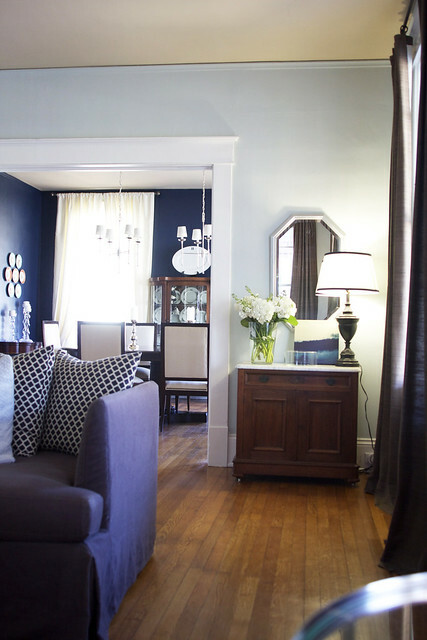 To make this happen, I brought in the navy blue of the dining room into the living room. This is the original plan I showed to the home owners. It changed a little but I thought you'd enjoy seeing the creative process. 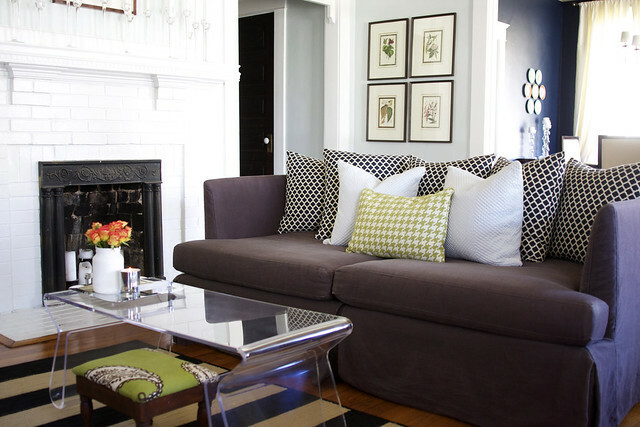 The biggest change in the room was adding new patterns and colors for the sofa pillows. 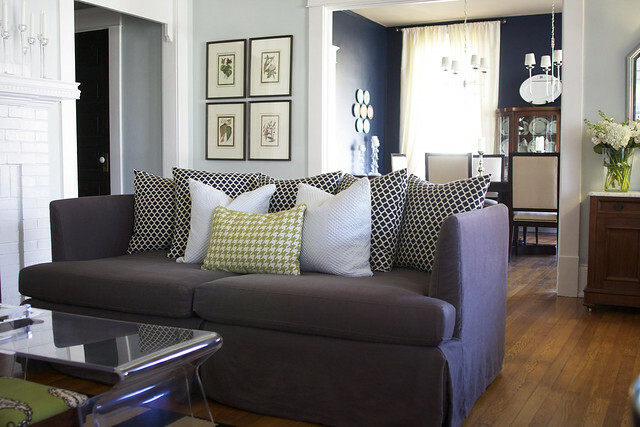 The back pillows have a navy quatrefoil pattern and the blue pillows are almost a perfect match to the wall color. So much better than the original brown that came with the sofa! 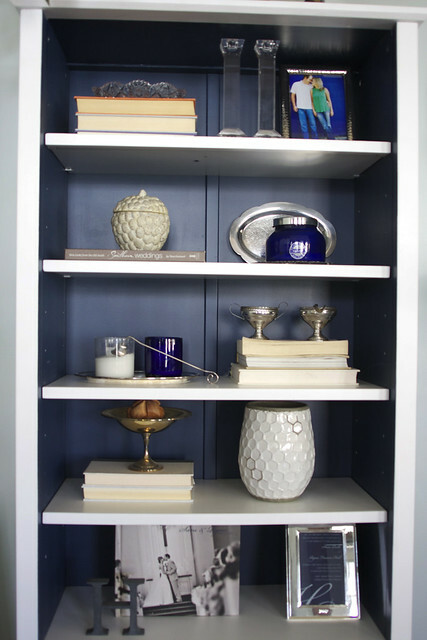 I added a ready made bookcase from Home Decorators and customized it by adding new knobs and paint. 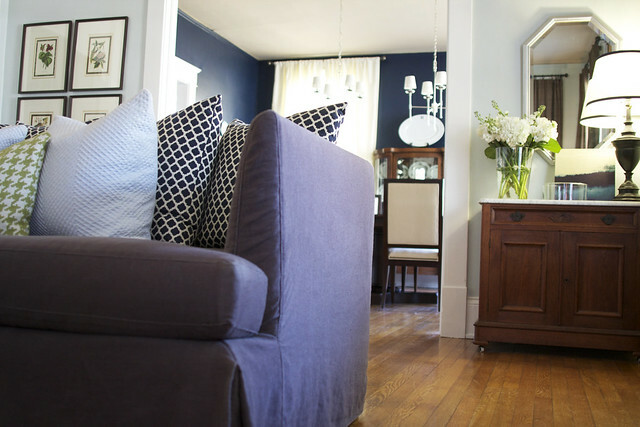 The paint is the same navy blue that's used in the dining room. We kept the existing TV stand and updated it by adding new polished nickel pulls. It's amazing what new hardware can do! 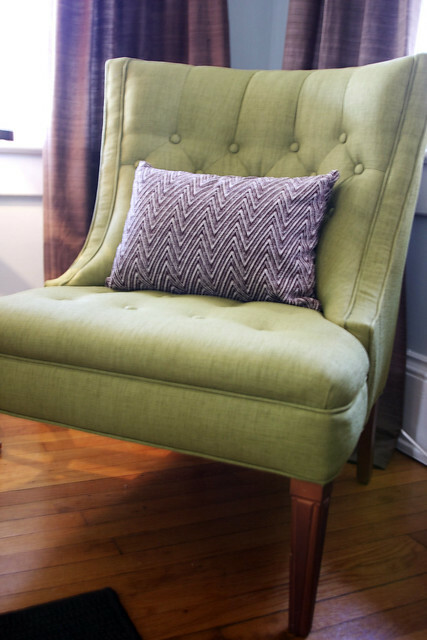 The chairs were also existing, but I had them recovered in a pistachio green fabric. 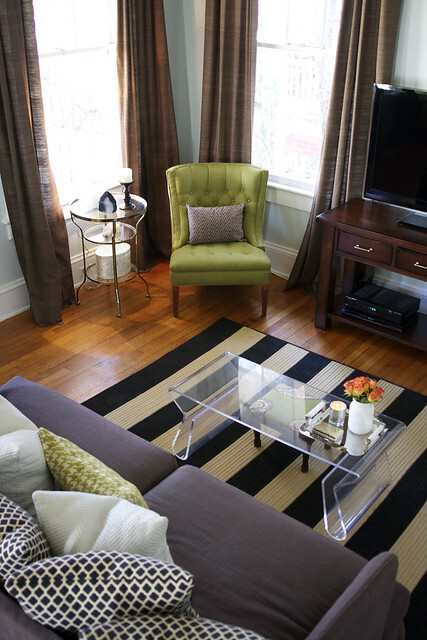 The rug is a navy and tan stripe (it looks black in some photos but is navy). I love doing subtle repeats in rooms (that probably only I would notice). 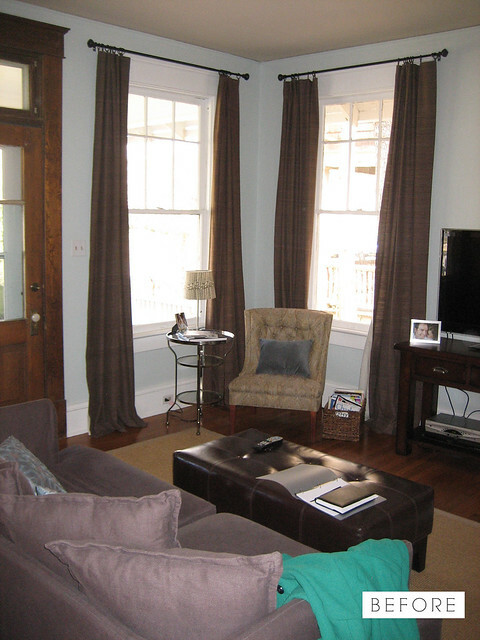 There is a chevron pattern on both the brown pillows on the chairs and the blue pillows on the sofa. The entry mirror was a flea market find by my client. When I told her to silver-leaf it I think she was a little hesitant, but it turned out perfect!! 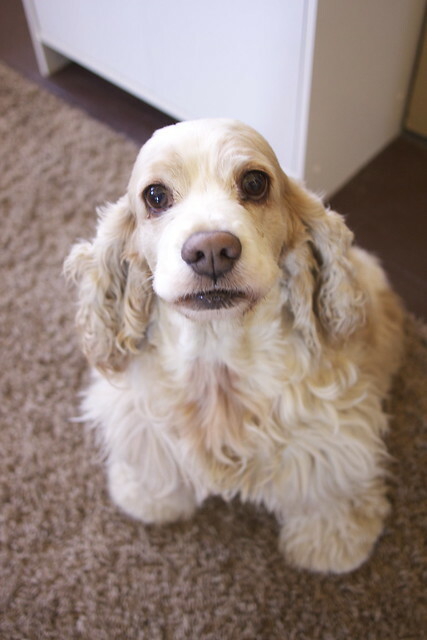 There is the owner's sweet spaniel, Samantha! These plates were a One Kings Lane find. They are hand painted and I had them framed in shadow boxes. Sorry for the excessive amount of pictures! I loved them all so much it was hard to narrow down selections for this post. I also want to tell you guys about my awesome client Sara who lives in this beautiful home with her husband Ryan. They were a DREAM to work with. Sara is a talented event planner here in Charlotte and is one half part of the Hall & Webb Event Design team. Check out their site here and their blog here. Like what you see? I'm available for local and out of town projects. Email me at bryn@brynalexandra.com. Lovely room!! I have been looking for a rug just like that. Where did you find it? I love this! And I love the way you used things the owner already had. I really like the curtains- do you have any idea where they came from? 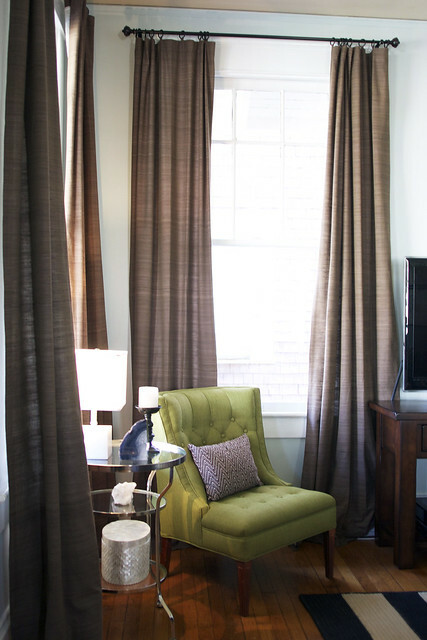 I'm looking for new curtains for my living room and those look so amazing in that space, I would hope they would look great in my space! You did SUCH a good job! This is my favorite room you've done. The details fit together so nicely, and the overall look has a lot of character. You're rockin' it, girl! Bryn - this is stunning! Where did you find the fabric for the back pillows? where did you get your rug? I love it! Great job. Bryn, this looks fantastic! What a transformation! Super fabulous job! Thank you for sharing, always looking forward to your before and afters! Keep 'em coming! oh my goodness, you did an AMAZING job! 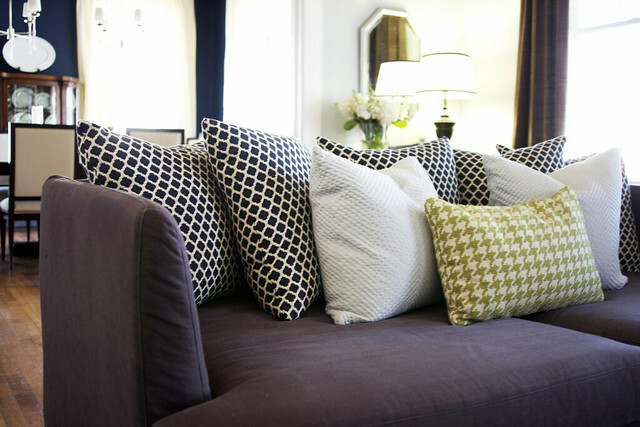 I would have never thought of removing the old sofa pillows...I probably would have just kept them and added more pillows. 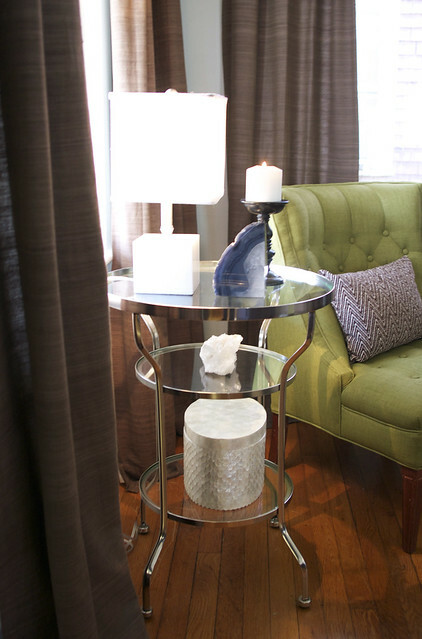 It looks fantastic and I love that lucite table! The actual design plan didn't take long at all! Just a couple weeks maybe. The implementation varies on the client and their budget, etc. Sherry thank you that means a lot to me!! 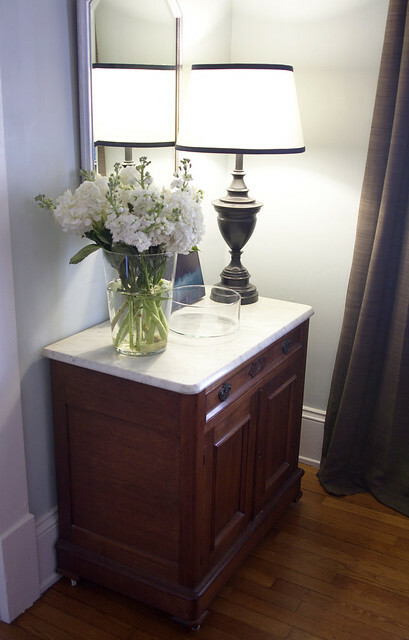 The marble topped cabinet is antique. The candlesticks are from IKEA! I have been following your blog for a while now and I love your work! May I ask where the marble top wood cabinet is from (I have been looking for something just like this) ? I also wondered where the glass candlesticks are from? They are beautiful. Beautifully done, Bryn! Your clients must be absolutely thrilled! 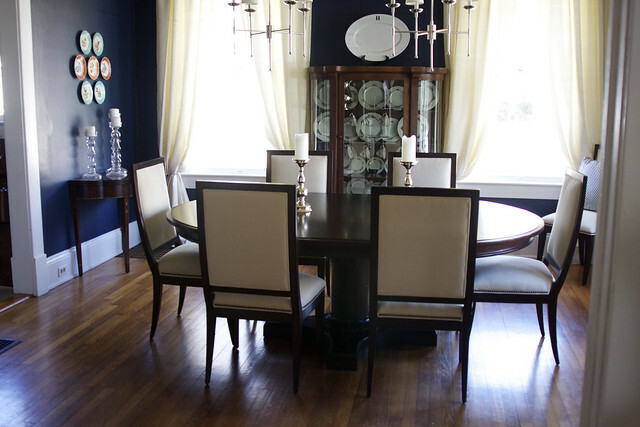 It's a beautiful makeover, and it goes so well with the lovely dining room. Congrats! Gorgeous! There is just the right balance of everything in this space. The homeowner did a beautiful job with the dinning room and I like that you didn't try to convince them to change it all and instead worked with what they have. Bravo!! Love your style! The Bryn touch! You are famous all around the world! The room is beautiful Bryn. I especially love that you decided to replace the solid couch cushions with patterned pillows. 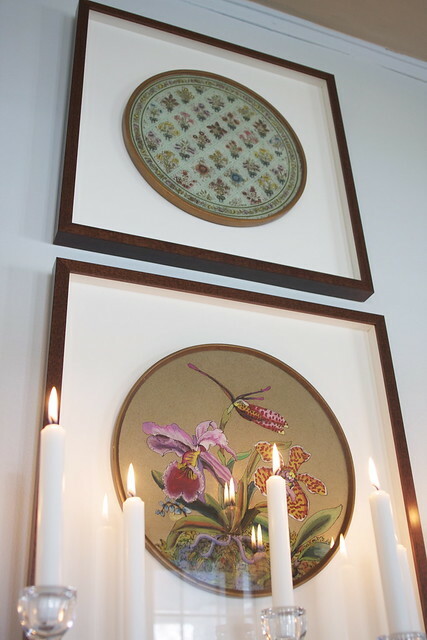 I also love the framed plates from OKL. Bravo! Wow, this looks fantastic! When I saw the "Before" pictures, I couldn't even imagine how you could help it, lol. But you made it look amazing and so high-end! My favorite parts are the framed plates and the green chair. I want that chair for my bedroom! It is exactly what I'm looking for with the round back and the tufts. Wow that looks amazing - love how it all flows together! Great job. It's all soooo gorgeous! I'm so glad you didn't edit down the pics! This is totally amazing. Job most stupendously done! What a transformation! It looks awesome. I really love that you introduced the color pistachio and that you brought in the navy from the other room. So cool. I'd live there in a heartbeat! Thanks Stephanie! That means a lot coming from a talent like you! 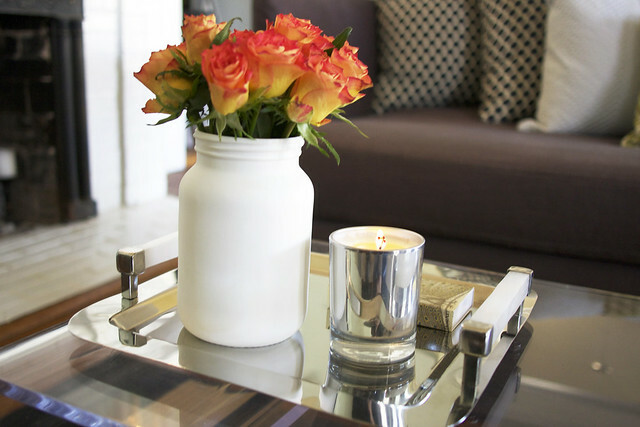 The glass and nickel table was pre-existing in the home. The shell box is from Home Goods! May inquire where the glass and nickel round table is from? Also wondered where the box on bottom shelf is from? looks so great! love it! makes me want to throw my cushions away on the back of my sofa and fill in with pillows. Love everything about this room! Perfection! 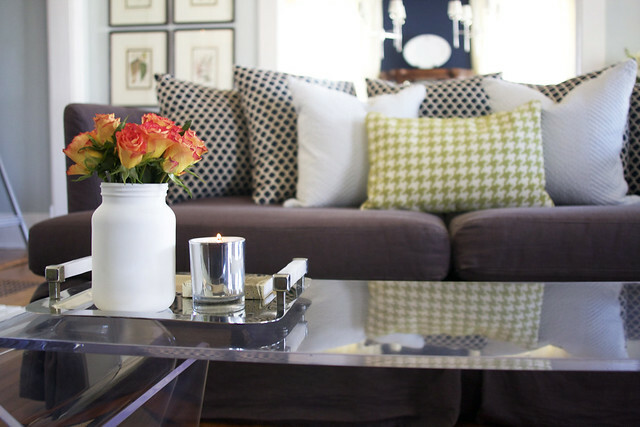 The mantel and that side table, to die for! Such an improvement Bryn! 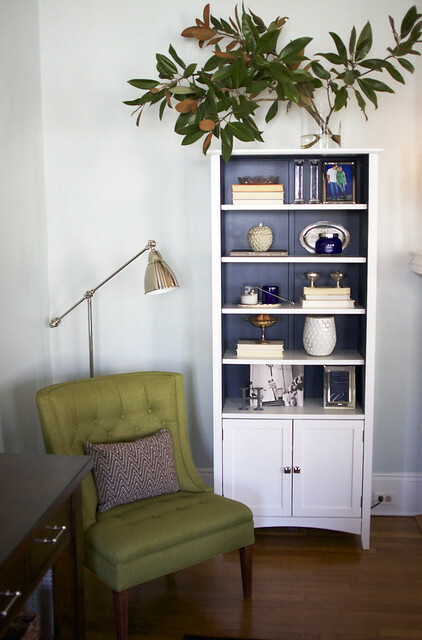 Love the painted bookshelf, pillows and new upholstery on those chairs. Seems like you made smart improvements without spending a huge budget! Oh my you did such a good job! I have scrolled up and down the page 3 times just to look at the pictures again! It looks wonderul- so fresh! I love your attention to detail- it gives the room such an easy polish! LOVELY! Bryn, it is amazing!! Fabulous in every way!! Congrats! Looks awesome! Where were the green chairs reupholstered? Bryn...thank you for being so great to work with...I might have to have you back! It's so fresh and pretty! Love all of the colors! The space is gorgeous. Thanks for sharing! Fantastic! 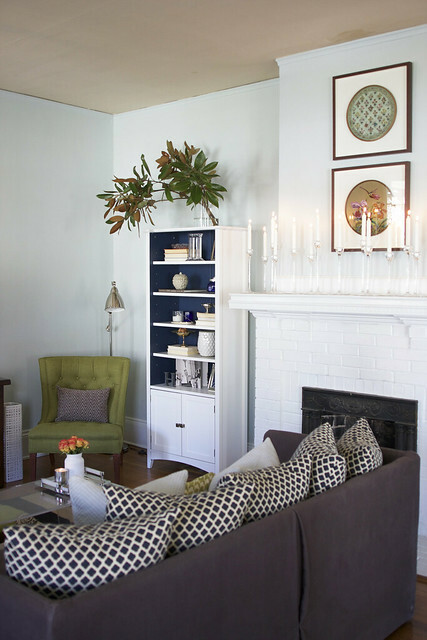 I love the pillows and all the candlesticks on the mantel. Great job! Absolutely beautiful!!! Great job, Bryn! Oh my goodness, Bryn, I love everything about this room. Seriously, you knocked it out of the park! GEORGOUS! 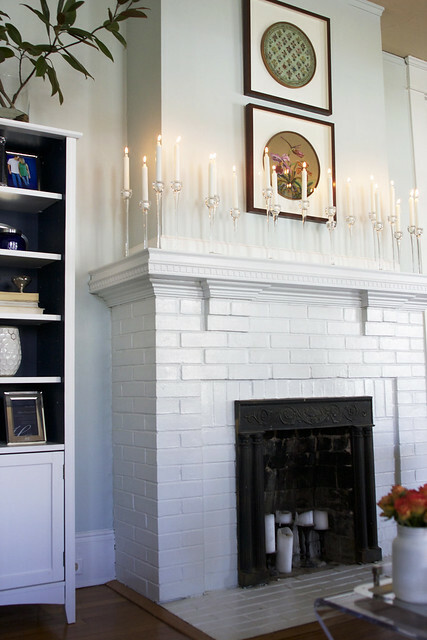 Love the fireplace and mantel! Beautiful transformation!! Love every bit of it! Bryn...you brought that room together flawlessly....The colors....and working with most of what she had.....it just really needed that punch. 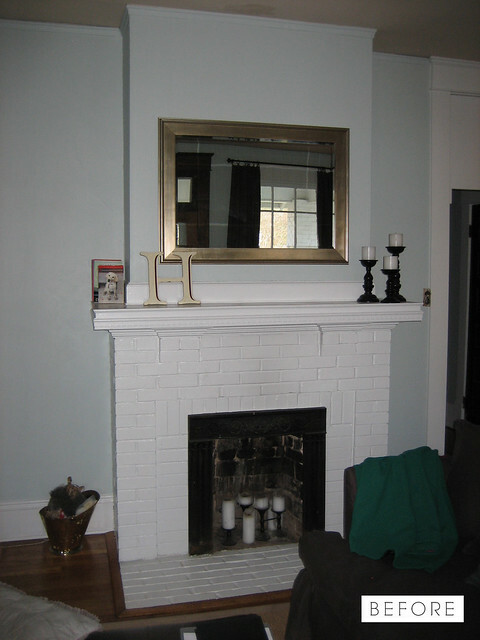 I absolutely LOVE the mantel treatment...one of my favorites. Changing out the coffee table was genius. I'm drooling! I love the color choices and how all the fabrics coordinate so perfectly. The space looks so polished and sophisticated now. Thanks for sharing. I just can't stop thinking about this color scheme, so I am revisiting to look and am commenting again! The navy and green give just the right amount of color, but still act as neutral because there are so many other colors that would pair fabulously with them. Take honeysuckle for example. Or a warm yellow. And seasonal decorating will be a cinch fall decorating and the holidays. Just perfect. You are my hero. You seriously never fail to amaze me. Way to go! Nevermind my first question...I should have read the comments below mine first! Ikea- wow!!!! I need to stock up! Bryn, Where did the glass candle sticks above the fireplace come from? I am looking for some like that. Also, just curious- how long did the whole design process for this project take? It looks AMAZING!!!! Looks great! Congrats on another room beautifully done! I love this room! You did a beautiful job. 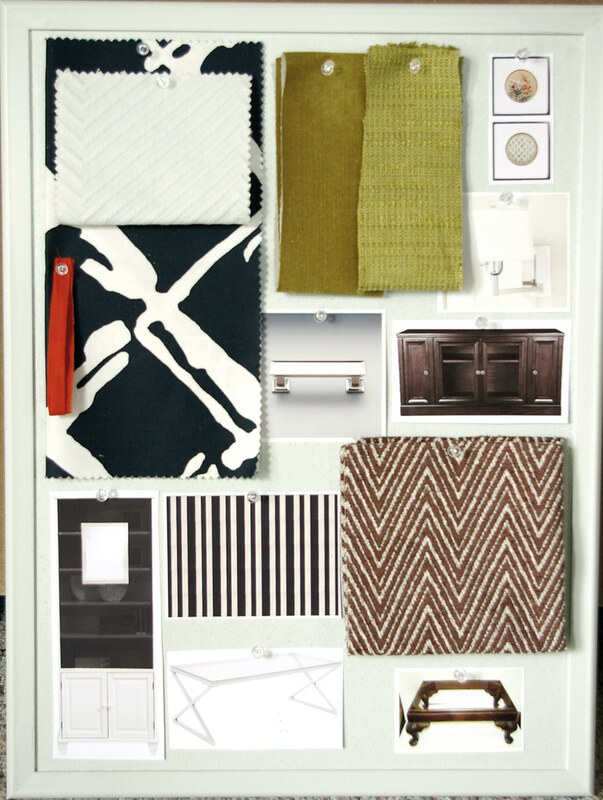 Would you mind sharing the navy pattern fabric used for the pillows and where you got the knobs for the cabinet? I really admire the combination of navy and green. Lovely. Bryn, Seriously, this is amazing. Lovely work, lovely lovely. Congrats! Oh, gorgeous! I am sure that Sara and Ryan are so happy with their new living room! You did such an amazing job! Every detail is perfection! 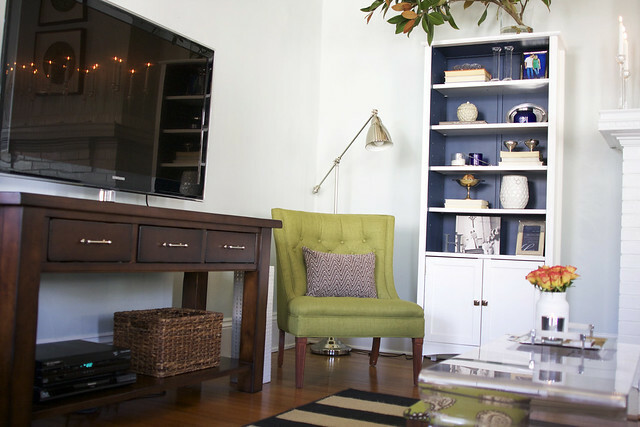 I especially love the navy-backed bookcase and the coffee table. Gorgeous! I LOVE this makeover. Is there any way you'd share the brand and color of that navy blue paint? ?